Justice Department Investigation Finds Pattern Of Excessive Force By Chicago Police : The Two-Way The investigation found widespread evidence of unconstitutional use of force. It was launched more than a year ago after a black teenager was shot and killed by a white Chicago police officer. 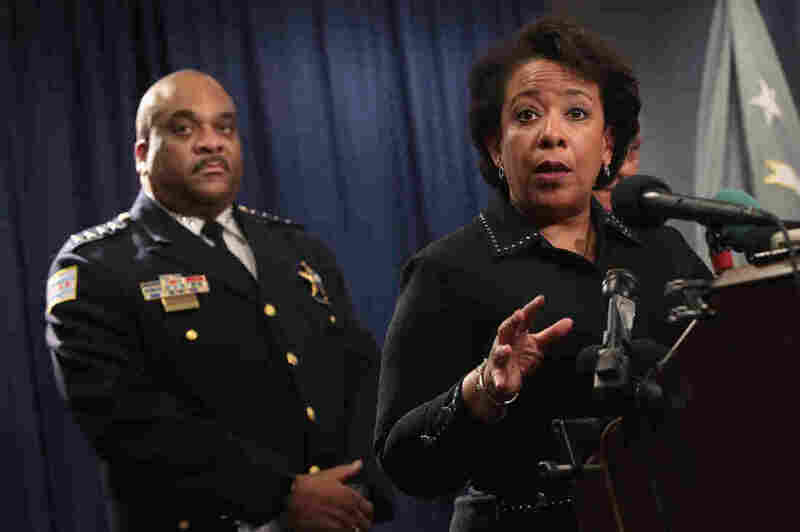 Attorney General Loretta Lynch, in Chicago on Friday, announces the release of a Department of Justice report citing widespread abuses by officers in the Chicago Police Department. The report is the result of a 13-month investigation. The Justice Department says an investigation has found Chicago police are systematically violating the civil rights of people in the city through excessive use of force, poor oversight and inadequate training of officers. U.S. Attorney General Loretta Lynch announced the investigation's findings on Friday, saying the DOJ had concluded there was ample evidence the Chicago Police Department "engages in a pattern or practice of the use of excessive force," in violation of the Fourth Amendment. The abuse is most prevalent in the predominantly black neighborhoods on Chicago's South and West sides. The report cited numerous examples of unreasonable force, such as kicking a subject who "balled his fists" and using a Taser against a suspect fleeing the scene of a "minor property crime." Principal Deputy Assistant Attorney General Vanita Gupta, who leads the Justice Department's Civil Rights Division, said the investigation had found that officers shot people who presented no clear threat and "tased" people who did not follow orders. Lynch said the city and the DOJ had agreed to enter negotiations about a court-enforced consent decree to guide reform within the police department. A federal judge also would need to sign off on any final agreement before it would go into effect. The Justice Department's "pattern or practice" investigation was launched more than a year ago, after a white police officer shot a black teenager named Laquan McDonald 16 times in October 2014, killing the 17-year-old youth. Under court order in November 2015, the city released police dashcam video of the killing, prompting protests by activists who said the city had tried to cover up the shooting. The police officer, Jason Van Dyke, has been charged with murder and is facing trial. The department has moved to fire Van Dyke, as well as four other police officers for allegedly lying about the shooting. Chicago Mayor Rahm Emanuel apologized for the killing and the handling of the video. "That happened on my watch," Emanuel said in December 2015, and he promised a "complete and total reform of the system," as The Two-Way reported. While the state court system is handling Van Dyke's individual case, the purpose of the Justice Department review was to investigate how such incidents reflected the larger culture and practices within the entire department. Federal investigators said Friday that they had interviewed hundreds of people and combed through data about use of force and how the police department held those officers who used excessive force accountable. In September, U.S. Attorney Zachary Fardon said the investigation had grown into the largest such probe ever undertaken by federal authorities, according to The Chicago Tribune. It was unclear what immediate effect, if any, Friday's announcement would have on the day-to-day practices of the Chicago Police Department. As the Tribune noted, "It will be months before a consent decree would be worked out and filed in federal court." Police departments have operated under consent decrees in cities ranging from Ferguson, Mo., to Newark, N.J., and just this week, Baltimore announced the details of a consent decree with its police department. Under President Obama, the Justice Department has increased the number of civil rights investigations into law enforcement practices, as Bloomberg has reported. But President-elect Donald Trump's nominee to become the next U.S attorney general, Jeff Sessions, has indicated he does not support consent decrees. At a Senate confirmation hearing Tuesday, Sessions said DOJ investigations into police departments "can undermine respect for police officers." He added, "I think there's concern that good police officers and good departments can be sued by the Department of Justice when you just have individuals within a department who have done wrong, and those individuals need to be prosecuted." In a 2008 policy paper on consent decrees, Sessions described the agreements as "one of the most dangerous, and rarely discussed, exercises of raw power" and said that "in practice, a decree can last for many years — longer than the remedy that was needed."